No wedding or party is complete without great lighting. 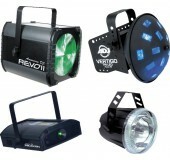 Avista rents up lights, disco lights, GOBO lights, Spot lights and other effect lighting. Easy to setup yourself for any event. Low heat & low power use. 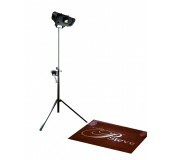 Professional lighting for a great price. 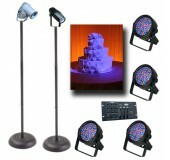 Price includes 4 uplights. 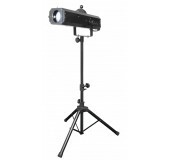 This DJ light rental is great for small to medium-sized dance floors, and includes 4 lights mounting and one tripod stand. Tons of Fun! 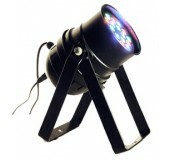 This is the perfect do-it-yourself GOBO light for wedding, parties and events. B&W or color with rotation! Stand Included. 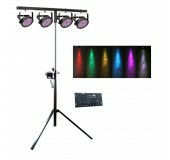 4 LED color lights with easy DMX control to create a beautiful head table, band stage or dance floor. Easy to use, full featured follow spotlight to enhance live performances. Great for smaller venues.